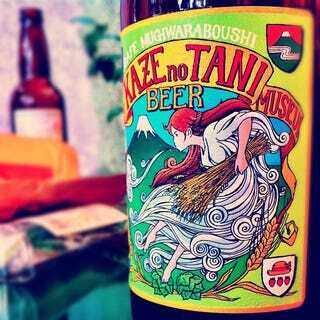 Does Studio Ghibli Have the Best Beer Label? Yes, Yes It Does. Studio Ghibli, known for classic anime like My Neighbor Totoro and now PS3 game Ni no Kuni, has a museum. And at that museum, there is beer. And that beer is awesome. The label reads "Kaze no Tani", a reference to Japanese title of Hayao Miyazaki's 1984 anime Nausicaä of the Valley of the Wind ("Kaze no Tani no Naushika"). In the middle, that's Nausicaä, the movie's heroine. The top of the label reads "Cafe Mugiwaraboushi", with "mugiawaraboushi" meaning "straw hat". In the bottom, there is a shield with a straw hat in it, like the one the character Mei wears in My Neighbor Totoro. Not only does Studio Ghibli make good movies. It also makes good beer labels. How many anime studios can say that? Check out 8 minutes worth of Nausicaa of the Valley of the Wind trailers.